So now you know how worthy it all is the next question should be “is it any good?”. Well the answer to that is “yes its bloody brilliant”! 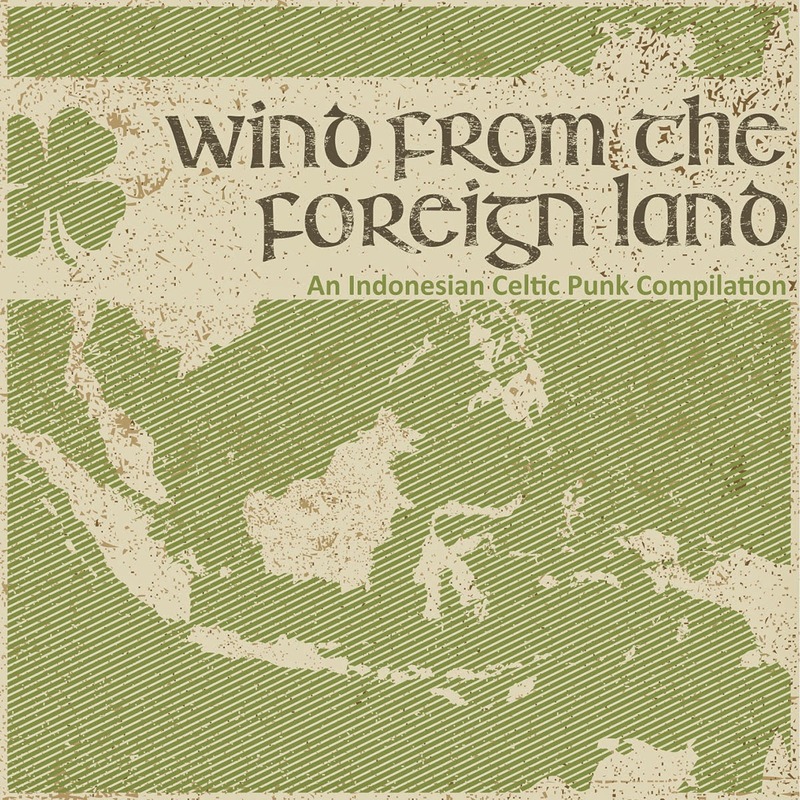 As with all compilations there’s going to be some tracks you like better than others but this album really does showcase the Indonesian celtic-punk scene very well and everything from the albums production to the cover to the mix of songs and the order they’ve been put in has obviously been a labour of love for all involved and in fact the only fault i can pick with the whole thing is that one of favourite bands have included a ballad rather than a more punky song! You’ll be amazed at how well these guys’n’gals play their instruments and you can have hours of fun playing this for your mates getting them to guess what part of Ireland the bands are from! Musically the fourteen tracks veer from everything from the Mollys to the Murphys to the Pogues and all points inbetween. Many sing in their own language which i love to hear, despite the obvious floor in not knowing what they’re singing about…Kicking off with a new band to me, Party Time, and great accordion and tin whistle led punk it is too. Traces too of what I can only suppose are Indonesian instruments and tunes. Unmistakable celtic-punk though with shouty lyrics and choruses. Panglima Kumbang are more north american sounding to these big ears, nothing wrong with that, with a more celtic-pop punk sound. Skarockoi start with a brilliantly played mandolin and fiddle and a more traditional celtic punk vocal style. Heard these before and always been impressed by them. Billy The Kid I have a few tracks by and this fantastic ballad shows exactly how good musicians they are. Black Rawk Dog is fast paced fiddle and mando punk played at breakneck speed with gang vocals. Ciusquad and Dirty Glass, another band I have heard before, and we’re half way through the album and still waiting on a duff track. No sign yet! Dirty Glass provide one of the standout tracks and its the production on this track i’m most impressed by. Gang vocals, celtic and brass instruments melting together with yer punk perfectly in a proper celtic-punk classic tune. Charlie’s Rum And The Chaplain are a band I only recently picked up on and are definitely one of the scenes leading bands. Starting off slow before heading to a more traditional fast paced tune and another of the standout tracks. Rain In Summer sound like The Pogues in their heyday with an acoustic punk song that soon turns into a proper celtic punk belter. Jeralax is another beautifully played ballad about whiskey. This track could be any of the scenes greatest bands to be honest. The Barley Hops I have also come across as well and they don’t disappoint either. Another standout track and followed by The Working Class Symphony who are quite simply a superb band. See definition at beginning of the review. Very accomplished musicians with great songs and vocals. Lots of instruments and band members but in the perfect production nothing is out of place or too loud or too quiet. Super Mario start with a bit of a DKM piss take and a great song follows. Finally the last track and the band we’ve been waiting for. The Cloves And The Tobacco (a kind of cigarette i’m told!) are arguably the best known of the Indonesian celtic-punk bands and they bring the curtain down on this great album with ‘The Indian Ocean’ the standout standout track. We can forget sometimes that we’re not the only sea faring race and in a country of over 13,500 islands these guys know their sea shanties. This album is, to put it as simple as i can, faultless. Great bands and great songs. Each one is worthy of following up on and each deserves to be as famous as any of the scene’s leading lights. simply click on the band name in Italics and you’ll be directed straight to them. They are mostly Facebook pages but not all. Celtic Punk Indonesia facebook group for all things Indonesian celtic-punk! CelticFolkPunkAndMore Spanish blog with lots in their vaults about Indonesia.